The Performance Vent System® is an EXCLUSIVE Mercury innovation that allows you to "custom tune" the venting of your propeller blades giving you the power to adjust your propeller to the way you boat. The propeller is directly responsible for how your boat reacts in the water. 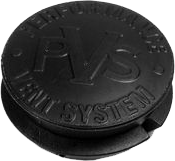 PVS (TM) allows you to adjust for changes in load and environment simply by changing the propeller’s vent plugs for optimum acceleration. On acceleration, the exhaust is drawn out of the vent hole. When the propeller blade strikes this aerated water, it pushes through it much easier than it would solid water causing engine rpm to increase more rapidly. Once you’re on plane, the water flows over the vent holes and seals in the exhaust, allowing the propeller to again operate in solid, nonaerated water.